Piotroski Score – A High Hurdle? I have a great deal of gratitude to the Global Strategy Team at SocGen for their extensive and insightful work around both the topic of this article and other rewarding quantitative measures. The original purpose of the Piotroski Score was to help him identify which individual stocks to select from a pre-screened value universe. He populated that value universe with the lowest quintile of P/B rated stocks which in itself has merit. 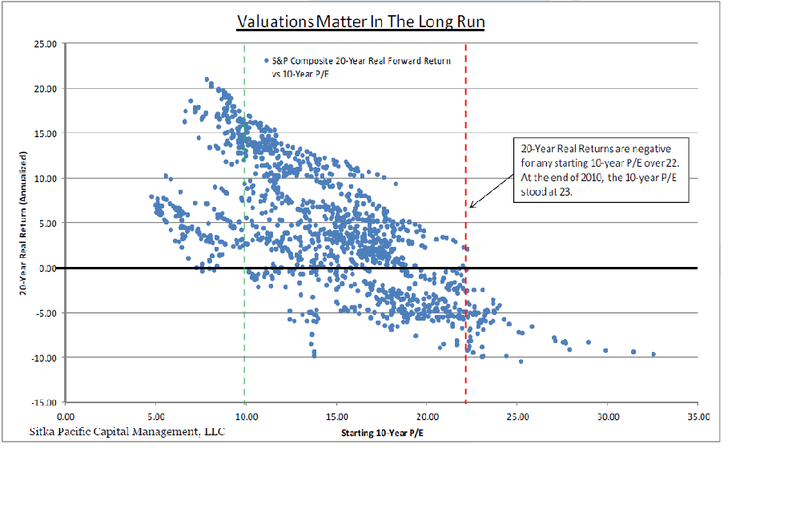 However, like with all pure valuation metrics, there is no qualitative analysis and there is an increased chance, if not a certainty, that some of the stocks will be “Value Traps” or “Cheap for a Reason”. The Piotroski Score is a 9 Factor Model consisting of binary tests based on a company’s profitability, leverage, liquidity and operational efficiency. Logically, the more of these the company can satisfy, the better it scores and the better an investment it is deemed to be. 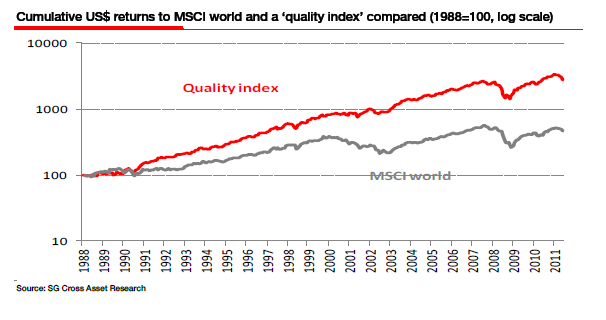 To whet your appetite, before we dive into the details here is a “Quality Index” performance against the MSCI World going back to 1988 – the “Quality” being basically High Piotroski scoring stocks. It doesn’t look that remarkable until you realise that the Y Axis is on a Log Scale! This stuff works! So here are the 9 Factors – a very decent checklist as to the health of any business! 1) ROA (Net Income/Total Assets) Positive? 4) ?CFO/?ROA Greater than 1? 1) ? in Leverage (LTD/LTA)? A business that can tick all 9 of these criteria is likely a fine one indeed, it must be operating profitably, with a healthy balance sheet, a shrinking share count and with sufficient liquidity to fund it’s short and long term plans. Crucially, by using the change in many of these metrics YoY we get an insight into the “Operating Momentum” of the business. I would highlight my report on British Sky Broadcasting from Sat October 15th where I said they“firing on all cylinders”– the stock has a Piotroski Score of 9/9. The good results it posted this week which saw the stock pop were somewhat predictable. I think it’s worth highlighting that historically, something like 40% of the global universe of stocks score 7/9 or more and so there is a need to be highly selective (Focus on 8’s or 9’s). There is a clear linearity to the average future expected returns from each discrete Piotroski Score. As the chart below demonstrates – low scores leads to low or negative returns, high scores lead to very impressive outperformance of the index. The most startling thing about this performance is that it is the annual returns of the various tranches of Piotroski F Score’s REGARDLESS of starting valuation. Let me reiterate, stocks that score a 9 on the Piotroski return an average of 15% in the US and UK, 18% in Europe irrespective of the price you pay. Wow! Now, I’m not throwing my copy of Margin of Safety in the bin quite yet (obviously a printed pdf as I don’t have $1500 to spend on a book!). I wonder to myself, what might happen if we combine the demonstrated outperformance of high scoring Piotroski stocks with what a value investor might consider to be “cheap” stocks. As we all know (I hope) the returns you get are a function of the price you pay. 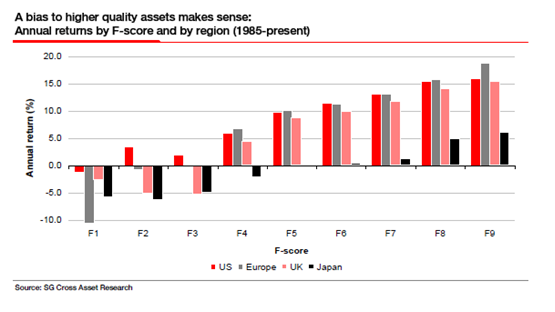 Thankfully, those hardworking chaps at SocGen have given this a bash…. 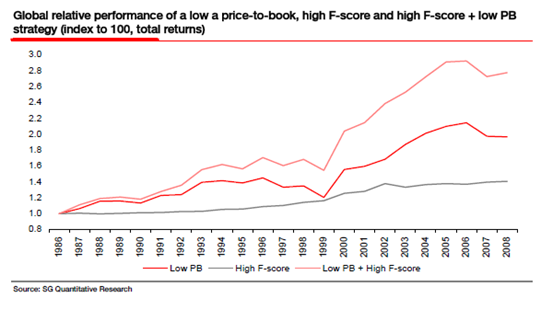 On their data since 1986, buying a portfolio of stocks with High Piotroski scores and Low Price/Book Values will have outperformed the index by in excess of 5% per annum. Not bad at all. Looking at the breakdown of relative out or under-performance of a Piotriski Portfolio relative to the index the superior results are remarkably consistent except in 3 instances – 1991, 2003 and 2009. These 3 years have one thing in common, they were Year One of a cyclical economic recovery, a period where the market seems to systematically reward poorer quality, higher leveraged businesses – those that survived that is! Dylan Grice refers to a “systematic undervaluation of quality” I struggle to think of anything more eloquent to top that. What this research does to my investment process is quite significant. As a lawyer and someone who would consider themselves “thoughtful” I err towards qualitative research, thinking about macro and trends and looking for a Variant Perception. However, what this demonstrates is the power of proper Quantitative Screening. If you can find a stock with a Piotroski of 8 or 9, which is trading on a P/E below 10 then you need a very persuasive reason on the qualitative side to exclude it from consideration for your portfolio. For a stock of that quality to be trading so cheaply it’s likely loathed by the industry and probably on the front cover of news papers for all the wrong reasons! Maybe BP post Macondo fit the bill or BSkyB just as the deal fell through and the sleaze allegations poured forth. In hindsight, what great times these were to invest in great companies! Our bias at that stage, when the Quant elements screen so well, should be to hold our nose and REALLY have a look at the company and to make our best educated guess as to whether their business operations are truly impaired to the degree that the market is pricing in. So next time you hear that Astra Zeneca has pipeline issues, that Dell are getting killed by Tablets, that Microsoft have gone stale and that Tobacco companies are going to get regulated out of existence just smile politely and say “we’ll see”. We become hung up on the headlines, on stories, on the specifics of the business model or the management team, where earning will sit relative to consensus and a whole lot of other noise. We should take a step back. You pay a high price for a cosy consensus. You don’t earn extraordinary returns by agreeing with the rest of the crowd that the current market darling can do no wrong. Buy Cheap, Buy Quality – It has always worked and it will take a lot to convince me that it won’t continue to work.